Dale, you've out-done yourself! Magnificent!!! Thanks LL, Hope it doesn't make anyone want to join up. And now Andy Cuomo is getting all hysterical; wants to microstamp all ammo. Seems he already forgot the tens of millions the State wasted on another bullet tracking program that in ten years did not solve a single crime. This system failed and was abandoned in MD and CA when NYS adopted it. The Brown shirts are coming to a town near you. IT is good to see Obama does as we tell him! Soon you will bow to the power of Islam! "...And may the odds be ever in your favor!" 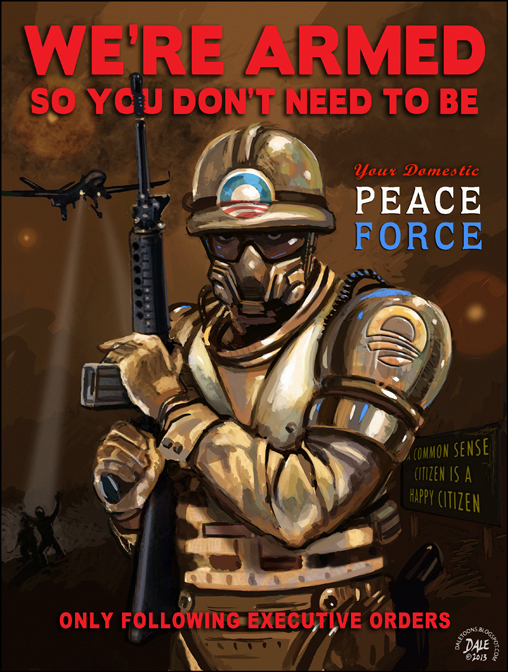 I heard those comments from then candidate Obama about the Civilian Security Force and thought it was so bizarre. Then there were so many other bizarre things coming out of his mouth with nary a peep coming from the media or anywhere else about it, and I thought perhaps I was overreacting. I thought I was savvy back then, that the media was bad, but not THAT bad, but now it's an entire country gone bizarre, but bizarre is the new norm, and it's YOU that's out of step, otherwise there'd be a much larger hue and cry. Well, there won't be a hue and cry, not with this media. Not with this Hollywood. Glad to see you're still here, Dale, fighting the good fight. I hope you keep it up. We need more like you! I would like to request permission to share this image with friends and other 2nd Amendment supporters. It will not be used for business or profit and only used in a respectful manner. How do I contact you for that permission? When does this poster go on sale? Anonymous (2nd Amendment) You have my permission to use as per your description. Thanks. Great work as always Dale. Are you planning anything on the three trillion dollar coin with O's likeness on it? From Edward, New York. No law will ever be able to stop mental patients from killing innocent people. This nut that killed all those children could have done the same thing by driving a car full of gallon bottles of gasoline into the elementary school. Will they start to ban all cars and stop selling gasoline? He could have also done it with a homemade bomb. This is just a solution to disarm the general public. Maybe if one of these teachers was packing a gun this nut would have been stopped dead in his tracks. Obama's biggest hero is Hugo Chavez - he wants to nationalize everything, disarm everyone, and redistribute everyone's wealth from the makers to the takers. 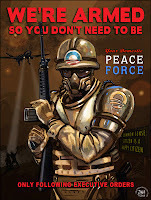 We all need to keep fighting this radical agenda tooth and nail till Obama's term expires. Dale, thank you again for doing your part to lead this effort. Yeah, Dale, you've outdone yourself all right, but in a Looney Tune nutjob soft of way. There you go again, anonymous. Those who can't jab and run. Dale, fantastic images and post. We've linked to your image via our web site at SHTFplan.com. If this is a problem, please contact me ( mac at shtfplan.com). Full credit has been provided within the article where it was used. I posted this on facebook and guess what? My account got suspended! Freedom of speech, just watch what you say! Truly an excellent illustration of a not too distant future, lest the people learn to withdraw their consent, bravo.